Sleeping is a basic, yet vital human need. As it is part of the foundation for good health and wellbeing, proper sleep plays a crucial role in immune function, metabolism, memory, and other vital functions of a human body. There are several current theories related to the human need for sleep that scientists try to understand. The inactivity, the energy conservation, brain plasticity, and the restorative theories are all rising fascinating questions that incite researchers to find answers for. However, even without complex explanations, we all know that no human could survive without having at least a few hours of sleep each night. Yet, regardless of its importance, many individuals deal with sleepless nights due to insomnia. Insomnia is a complicated condition that defines the inability of people to fall asleep. It is categorized as a sleep disorder having symptoms such as low energy, fatigue, mood disturbances, and decreased performance at work or at school. All those conditions are triggered due to the fact that the brain is unable to rest and regenerate as it would normally do during a good night’s sleep. There are two types of insomnia: primary and secondary insomnia. Primary insomnia refers to the inability of a person to fall asleep which’s cause is not directly associated with any other health condition. On the other hand, secondary insomnia may be a condition triggered by something more serious such as depression, arthritis, cancer or the medication they are taking for these health problems. Although people fail to understand the importance of a good sleep environment, it is strongly linked to acute insomnia. Environmental factors such as noise, light or extreme temperatures, both hot or cold, can interfere with your sleep. Here is how to create the ideal home sleep environment for better sleep. For all times, the timing of the day and night has been the dependent tool used by humans to develop patterns of activity. The absence of light sends critical signals to the body inducing the need for sleep and rest. On the other hand, light exposure alerts the body’s internal, so-called, “sleep clock” promoting the need for physical and psychical activity. Light exposure at the wrong times interferes with the internal clock of our bodies, disrupting the sleep-wake cycles. The way that light reduces the quality of sleep is through the specialized light-sensitive cells in the retina of our eyes. Our sleep patterns are set accordingly to these cells. They are located in the same space of our eyes as the rods and cones which make vision possible for humans telling the brain whether it is daytime or nighttime. In addition, artificial light exposure by having technologies in the bedroom creates numerous extra stimulations in our sleeping environment. Moreover, apart from the effects on sleep linked to light exposure, there have also been suggested consequences for our health including increased risk for depression. What makes technology an increasing alarmingly sleep problem is that it appears to be found both in the bedrooms of parents and children. The exposure to the technology of the young generations starts at very early ages. Parents fail to understand that limited exposure to devices is required in order to protect their children from delayed bedtimes. Proper sleep is significantly more important for infants and children as it influences mental and physical development. Leaving the devices on at the night can prevent their children from falling asleep because they get distracted by them and have increased exposure to the artificial blue light before bedtime. Therefore, electronic devices which can produce light in your sleep environment need to be eliminated. The focal point of any bedroom and the most crucial factor for a good night’s sleep is, obviously, the bed. Your bed has the most impact on your health by promoting good sleeping posture. The ideal sleep environment is the one that soothes all of your body’s senses and eases you into sleep. Therefore, specialists recommend choosing high-quality and comfortable mattresses and pillows for your bed. The bedroom linen plays a vital role in creating a cozy sleep experience. 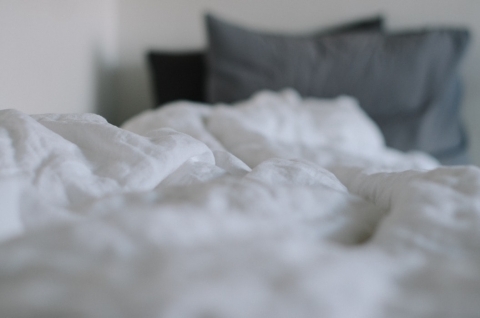 A healthy bed that promotes good sleep should be easy to clean and sanitize, ergonomic to support a healthy sleep posture, and highly insular for temperatures from both warm and cold seasons. Noise is another external factor which may interfere with your night sleep. Whether the sounds come from the inside of the room or from external environments, they can prevent our brains from getting to sleep causing insomnia. Although they might not fully wake you up, abrupt sounds can arouse you slightly and affect sleep cycles. Numerous medical studies have proven that even low-impact noises may impact health due to sleep disturbance. Noise in the sleep environment cannot only prevent sleep but can also become disruptive by waking you up from your sleep. A quiet room is essential for ensuring that no sound will give you a hard time falling asleep. Once again, electronic devices should be eliminated from the sleep environment or silenced during the night. To minimize noise pollution during rest and sleep better, turn off any electronic device from your house and choose a quiet room that is located away from the traffic related noise. 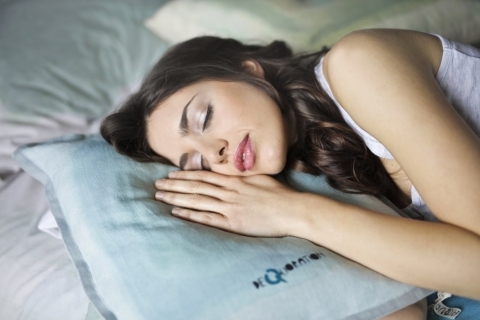 Another factor that influences good night’s sleep is the ideal room temperature. The temperature has to be just right for an excellent night’s sleep. Depending on your own temperature preferences, set the thermostat to constantly keep your sleep environment hot or cool depending on the season. Creating an ideal sleep environment is crucial for every individual. Moreover, as sleep impacts mental and physical development, infants and children need to have a sleep environment which is protected from any type of distraction during the night sleep. To conclude, the wrong sleep environment in the bedroom is causing sleep problems. Taking a little time to ensure a proper sleeping environment is one easy, yet crucial way to protect and improve the nightly rest.